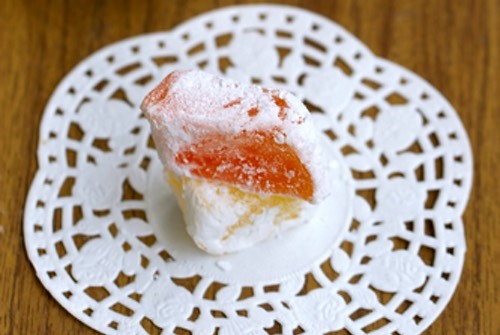 When Turkish Delight recipes first appeared, it's impossible to know. Turkish Delight's date of origin is unknown, but it has long been an inseparable part of Turkish tradition and symbolizes the exotic and delicious confections of the Middle East. It was in 1994, while exploring the Suq (market) in the old Muslim Quarter of Jerusalem, that I first purchased some authentic Turkish Delight from a friendly Arab confectioner. The generous-sized squares of pastel-colored, jelly-like candy were generously coated in finely powdered sugar and carefully wrapped in white tissue paper. The Turkish candy tasted deliciously sweet and was quite unlike anything you can buy in the stores. Both in texture and in taste, it was extraordinary and truly wonderful. Now, thanks to the old fashioned recipes below, you can actually make your own. 8 tablespoons granulated gelatine, 1/2 cup cold water, 2 cups sugar, 1/2 cup boiling water, 1 orange (rind and juice), 3 tablespoons lemon juice, nuts or shredded coconut or candied fruit — optional. Soften gelatine in cold water. Make a syrup of sugar and water; when boiling add gelatine; boil gently 35 minutes. Remove from heat. Add fruit juices; strain. Add candied fruit, nuts or shredded coconut. Pour into a pan moistened with cold water. When firm cut in squares using a knife dipped in hot water. Roll in confectioners' sugar or fine fruit sugar. 1 lb loaf sugar, 1/4 ounce gelatine, 1 cup water, juice 1 lemon, 6 drops cochineal (red food colouring). Soak the gelatine in half the water for 3 hours. Boil the sugar in remainder of the water for 5 minutes. Pour over the gelatine, add lemon juice and cochineal, and stir well. Pour into a wetted, shallow dish, and when cold, cut into squares and roll in confectioners' sugar. My wife and I often chuckle over a humorous incident that occurred when shopping in the Suq. 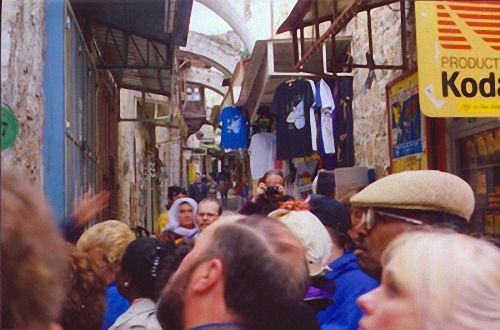 The historic marketplace has extremely narrow streets bursting with all manner of tiny shops; it's packed with people and bustling with activity. "Hey! Don't buy off him! Come over here and let me rip you off." Thanks to these old fashioned Turkish Delight recipes, you can make a delicious Middle East treat for your family to enjoy. Homemade Turkish Delight squares packaged in a decorative container make a great candy gift suitable for giving on any special occasion.